Rural Revolution: How are onion sets formed? Last spring I tried growing onions from seed. It's a tough process -- not the actual growing (that's easy) but the keeping alive. I planted 200 seeds, and most of them keeled over and withered away after a couple of weeks. Clearly I have a lot to learn about how to grow onions from seed. So in the end I bought onion sets from the feed store and my onions grew beautifully. Which begs the question... how do you "make" onion sets? How are onions sets formed? What ARE onion sets? This question has been nagging at me, but every time I do an internet search all I get is articles on how to grow onions from sets, NOT how onion sets are formed to begin with. So yesterday I pulled up our onions and was very pleased with what I got. If so, what did I do "right" in this particular case, and why didn't the other onions grow them? How can I reproduce onion sets again and again? If there's one thing I've learned in the 5+ years I've had this blog, it's to seek the wisdom of the faithful followers. So, dear readers, what are your thoughts? How do I grow onion sets? To make onion sets: grow baby onions from seed towards the end of the season. Pick and store them when they're about the size of the sets you can buy. The onion sets you can buy are basically created in this same way. They're tiny onion that never got to full size. When you plant your sets the following year, they should have the same results, whether you stored them yourself or bought from the store. Onions, however, will try to go to seed the second year. No Patrice, this is a variety of onion called a 'multiplier'. Egyptian walking onions are a variety of multiplier.The bulbs are very small and hot, but good. They tip over and grow new onions or 'walk' as they move around the garden growing from the 'sets' up on top instead of from seed. Easier to keep going than seeds. Can't help you with the onion set problem. I have also tried to grow onions from seeds, with varying success rate, none of them stellar. I have learned, tho that sowing midseason will produce small green onions, that when harvested & dried, make great little onion "sets". I've never gotten more than a dozen or two, but I haven't put a great deal of time & effort into it, either. I have done better by leaving one or two onions go to seed in the lettuce bed (the onions surround the lettuce bed) & just letting them grown among the lettuces. I don't grow the onion sets any more because they want to go to seed. Even if I break off the seed stalk as soon as I notice it the onion doesn't store as well. Usually I can buy a bunch of young onion plants at my local Co-op farm store here in Wyo. Sometimes I have to buy them earlier than I want to plant, but I have been able to keep them until I am ready to plant. When I want to grow onion seed I make sure that the seed is only a year old. By the second year the germination rate goes way down. I use Miracle Grow potting soil and a good size tub. I plant the seed in mid Feb. and keep them in the house until they start to come up. Then I put them out in my small green house so that they can get the light. I especially like Copra onions because they will store through the next May. Patrice, I have grown onions from seed, but I start them in a tub in the house in early February. Then as the temperature warms up, I move them out onto the west porch until I can plant them in the garden. I find giving them a head start in the house makes a difference. I agree with Anonymous. The picture you show with the small onions at the top of the plant is a multiplier onion. I grow them also, but in the herb bed so I can let them 'multiply'. The small onions at the top of the plant to make tasty little green onions if you have an abundance of them. I found this on Wickipedia. The second paragraph contains a remark about "onion sets". Hope this helps. Thanks for your down home blog. I appreciate your family values very much. Onions are best cultivated in fertile soils that are well-drained. Sandy loams are good as they are low in sulphur, while clayey soils usually have a high sulphur content and produce pungent bulbs. Onions require a high level of nutrients in the soil. Phosphorus is often present in sufficient quantities but may be applied before planting because of its low level of availability in cold soils. Nitrogen and potash can be applied at intervals during the growing season, the last application of nitrogen being at least four weeks before harvesting. Bulbing onions are day-length sensitive; their bulbs begin growing only after the number of daylight hours has surpassed some minimal quantity. Most traditional European onions are what is referred to as "long-day" onions, producing bulbs only after 14+ hours of daylight occurs. Southern European and North African varieties are often known as "intermediate day" types, requiring only 12–13 hours of daylight to stimulate bulb formation. Finally, "short-day" onions, which have been developed in more recent times, are planted in mild-winter areas in the fall and form bulbs in the early spring, and require only 11–12 hours of daylight to stimulate bulb formation. Onions are a cool-weather crop and can be grown in USDA zones 3 to 9. Hot temperatures or other stressful conditions cause them to "bolt", meaning that a flower stem begins to grow. Onions may be grown from seed or from sets. Onion seeds are short lived and fresh seed germinates better. The seeds are sown thinly in shallow drills, thinning the plants in stages. In suitable climates, certain cultivars can be sown in late summer and autumn to overwinter in the ground and produce early crops the following year. Onion sets are produced by sowing seed thickly in early summer in poor soil and the small bulbs produced are harvested in the autumn. These bulbs are planted the following spring and grow into mature bulbs later in the year. Certain cultivars are used for this purpose and these may not have such good storage characteristics as those grown directly from seed. Routine care during the growing season involves keeping the rows free of competing weeds, especially when the plants are young. The plants are shallow rooted and do not need a great deal of water when established. Bulbing usually takes place after twelve to eighteen weeks. The bulbs can be gathered when needed to eat fresh but if required to be kept in store, should be harvested after the leaves have died back naturally. In dry weather they can be left on the surface of the soil for a few days to dry out properly, then they can be placed in nets, roped into strings or laid in layers in shallow boxes. They should be stored in a well-ventilated, cool place such as a shed. seperate the sections and grow 3 new onions. 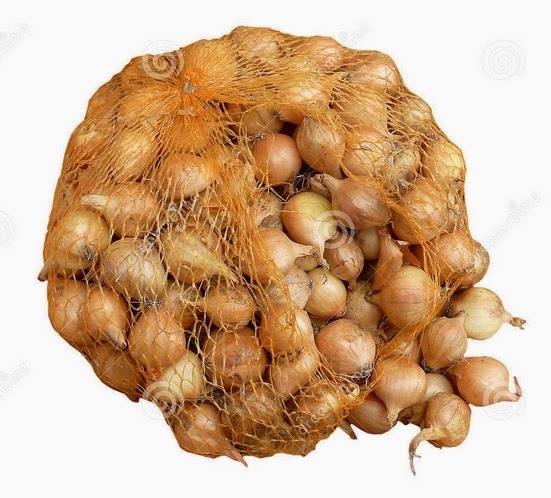 Onions typically take 2 years to grow from seed. After one full season of growing from seed, you have sets (baby onions). After the second full season of growing you have full grown onions. I used to harvest the sets and replant the following year, because that's what my dad did. But one year I missed some and they started growing in the spring, so now I put out the seeds and harvest the second year. They overwinter very well. I might loose a couple out of about 80-100 per year. I grew onions from seed this year. Started them about March in Midwest. I read over at Hickory Holler Farm blog about needing to trim back the green tops a few times as they got tall to help the onion form bulbs. I kept the green tops about 5" tall inside, so I had to trim two/three times before the onions got outside. Once planted outside I trimmed one more time when they got long. Next year i'll try trimming one more time. A few of my onions were baseball size. I was happy with the results. Growing onions from seed is more work, but I'll probably do it again next year. I tried growing onions from seed, and they just never got big enough that I thought they could handle the transplant. I have done lots of reading, too! The picture of the sets does look like a walking onion. I was blessed to find a patch of them on some land we bought, and I was able to transplant several. I am not convinced that what you have is an actual walking onion, though, unless you planted some yourself. Sometimes plants do weird things on a whim! Here is an article I pinned about growing onions. Lots of info! If you aren't on Pinterest, it is a wealth of information on all kinds of topics. LOVE it! The reason your seed starts are failing may be that onion plants are very vulnerable to damping off disease, where the center of the stem withers and the plant flops over. This usually happens when the plant is 1"-2" tall. The problem is the soil or the starter cells. The mold that causes the disease is in nearly all soils, but seed planted outdoors is usually not effected. Perhaps the sun sterilizes the soil enough to prevent the mold from forming. The way around it is to use sterilized potting soil for your seeds. First hose off your starter cells, and then spray them down with a tsp. of bleach in a qt. of water in a hand sprayer. Then wash the cells in warm soapy water and let them dry completely. Plant the seeds using sterilized potting soil, and spray water them with distilled water or bottled drinking water (it's sterilized with ozone) until the plants are more than 2" high. You can start hardening off your plants when the weather gets past the last frost date for your area.